The time left between the Samsung Galaxy S6 and your hand reaching for it is ticking away as we speak. The excitement is understandable - it is the single hottest Android smartphone right now, offering a blend of premium design and unmatched hardware power. It also has a display to fall in love with - a crisp 5.1-inch 1440p resolution panel covered in Gorilla Glass 4. Corning's durable glass layer is actually a compelling reason to go screen protector-free for your Galaxy S6. But just so you know, slapping one on its screen is a very good choice nevertheless. It will preserve the display into a factory-like condition, preventing oil, moisture, and daily use from giving it a worn-in, aged, smeary look. It will also help you get a good price when you sell the smartphone later down the road. If you're ready to order a screen protector for the Galaxy S6, take a look at these products. Amazon is already full of them, and even better models will be coming down the road! -Protects your mobile device screen from daily scratches, dust, scrapes, and normal signs of wear. -Made from the highest quality tempered glass. -100% Bubble-Free Adhesives for easy installation and no residue when removed. 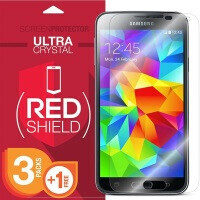 -9H Strong Hardness Anti Scratch: three times stronger than a regular screen protector film. -Protects your screen from scratches and drops. -Pre-cut to fit your screen exactly. -Hard coated for Scratch Proof (Hardness: 3H-4H). -Dry Application: Easy to Install and Remove. -Made of High Definition Transparency Film. -TrueTouch Sensitivity and antibacterial coating. -Perfect cutouts on the front. -Made of real premium tempered glass with rounded edges. -Anti-fingerprint oleophobic coating with silicone bubble-free adhesive. -Precise cut for best fit and easy installation. -Package includes one glass screen protector and an installation kit. -Significantly reduces glare, dust, oil & fingerprint smudges. -Clear & smooth glass-like surface. -Made of military grade material, designed to be ultra tough. -Sold under ArmorSuit Lifetime Replacement Warranty.